Eucalyptus olsenii is known as the Woila Gum and grows into a tree reaching 12 metres in height. The bark is rough on the lower part of the trunk whilst the rest of the trunk and branches are smooth, white, cream or grey. Leaves may be lance-like or curved, up to 12 centimetres long, two centimetres wide and glossy green. 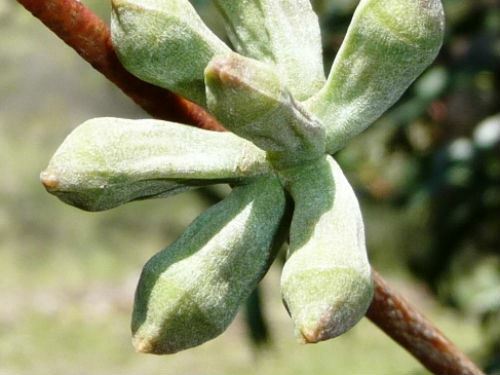 Buds are carried in clusters of seven and have distinctive ribs or ridges (see thumbnail). Large white flowers are carried in spring and summer. The woody fruits, that follow the flowers, are barrel or urn-shaped and two centimetres long. In our cold climate garden E. olsenii has proved tolerant of drought and frost, fast growing and free flowering. Our specimen flowered for the first time about four years after planting. 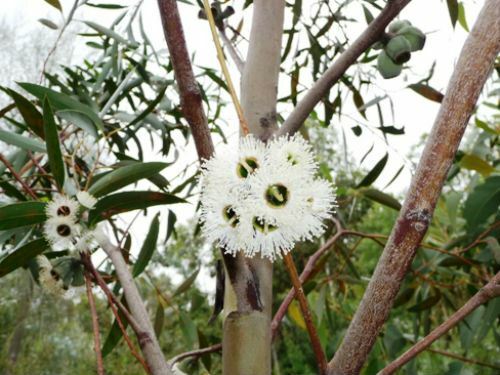 Eucalyptus olsenii is classified as a rare species because it has a restricted range. All known populations are protected in two national parks, Deua and Wadbilliga on the Southern Tablelands of New South Wales. The common name refers to Mother Woila Mountain and Woila Creek, both locations in Deua National Park.